The word “answer” is spelled A-N-S-W-E-R. The letter W sits between S and E but you don’t hear it. It’s a silent letter. 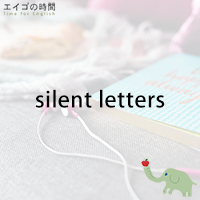 The words wrapping, wrestling, wrinkles also have a silent W.
There are many more words in English with silent letters. The words knock, knife and knee all begin with the letter K although you don’t hear it. Autumn, column and condemn all end with the letter N but again you don’t hear it. There’s no G sound in the words daughter, thought, right, height, might, weight and tough. But when you spell these words, you’ll see the letter G in them. Listen and fasten has a silent T while hour and honest have a silent H.
1. There’s no silent letter in the word “Wednesday”. 2. There’s a silent letter in the word “rendezvous”. 3. There’s a silent letter in the word “psychology”. Next Post イマイチよく分からない。 – I don’t quite get it.